The mission of the College of San Mateo Archives is to document and preserve the institutional history of the College of San Mateo and the San Mateo County Community College District. 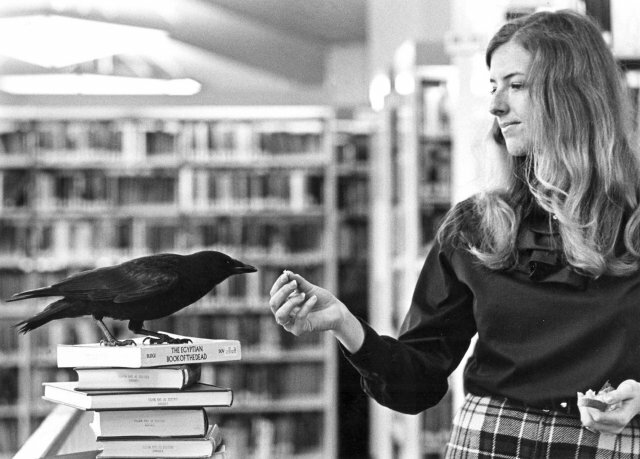 Clovis the Crow in Library, (1970s or 1980s). College catalogs, class schedules, commencement programs, student newspapers, yearbooks, etc. It is important to note that the collection is incomplete. For some years there are no items available. Students, faculty, administrators, staff and community members are welcome to view items in the archives collection by appointment. Please contact the Reference Desk to schedule an appointment. An index of materials held in the archives is located in the Special Collections Binder which is located at the Library Reference Desk. Archival materials are for "Library Use Only." Items from the collection may be photographed or photocopied by arrangement with library staff. In order to protect the materials, patrons are required to use pencils when taking notes.